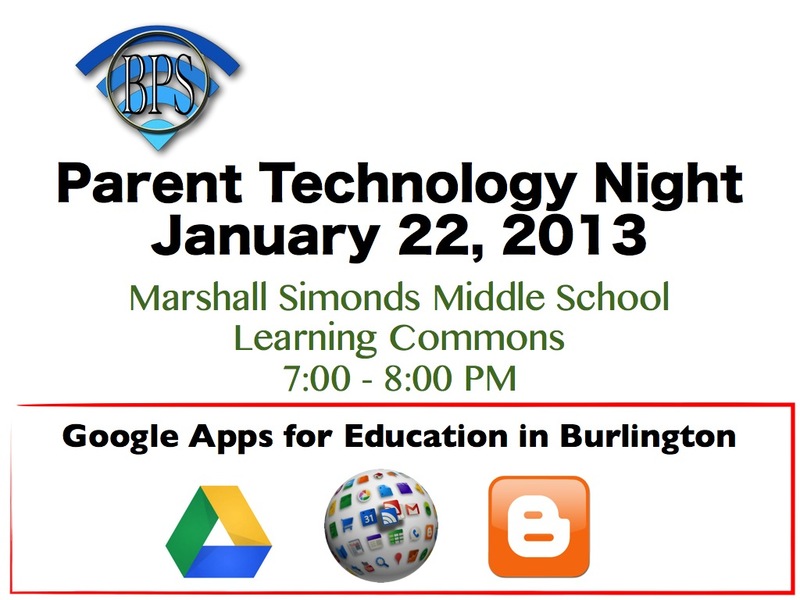 The Burlington EdTech Team will be hosting its first Parent Technology Night of 2013 on January 22 at Marshall Simonds Middle School. The topic for the discussion will be Google Apps for Education in Burlington schools. Please join us for an opportunity to learn about some of the powerful technology tools being used by Burlington students. The session will highlight how our students are beginning to use Google Apps during the 2012-2013 school year. Time during every session is also dedicated to technology related questions and support. The session, led by Dennis Villano, Director of Technology Integration, will be held in the new MSMS Learning Commons on the second floor.